When I first started teaching, I had a pretty good idea of what shared reading could look like in a Kindergarten or first grade classroom. I knew that I could use big books, large poems, and other enlarged texts for shared reading. But beyond first grade, I really wasn’t sure what shared reading should look like. I knew I wouldn’t be using big books with “big kids,” but then what should I use for shared reading? Would the purpose be the same? 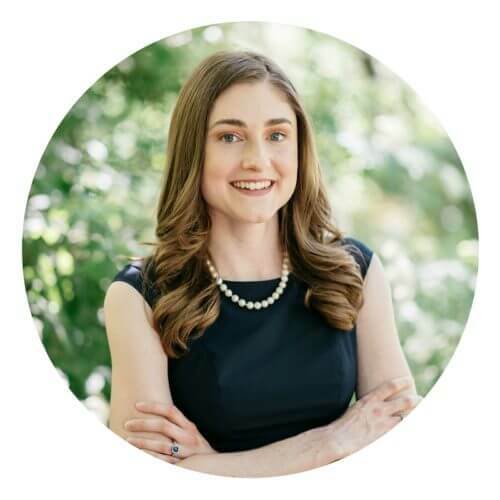 I don’t think I was alone in my confusion, either – I’ve talked to quite a few teachers who aren’t quite sure what shared reading is, what the purpose is, or how it’s different from a readaloud. For some reason I forgot to mention the most basic thing in the video…that you, the teacher, are the one doing the reading! Sometimes you might read poems or parts of stories chorally, as a class, but the majority of the reading is done by you. Shared reading is an instructional strategy that can be used to teach many different reading skills (comprehension, fluency, decoding, vocabulary). It is appropriate for just about any grade level. You can use many different types of materials for shared reading, as long as all students can clearly see the print. With younger students, you can use big books or poems written on chart paper. You can also take a regular-sized book and place it under the document camera so that the text is enlarged and easily visible. Reading A to Z and Readworks are other great resources for shared reading. You can find a text and display it on an interactive white board or screen so that students can clearly read it. Some teachers give students copies of the text for shared reading. This allows all students to clearly see the words when the text can’t be easily enlarged. With primary students, however, I prefer to use the document camera to enlarge small texts – I just feel that I can better hold their attention when everyone is looking at the same text together. Texts for shared reading can be either fiction or nonfiction. I’ve even heard of teachers using “real-life” texts like maps and brochures for shared reading! 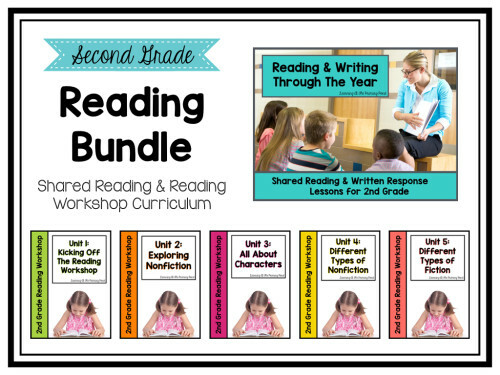 For complete shared reading lessons, check out my second grade reading bundle. 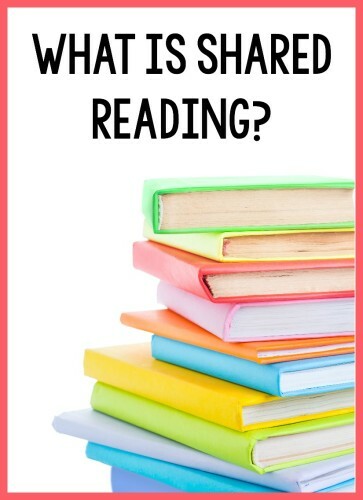 What is taught during shared reading? Just about any reading skill can be taught through shared reading. At the beginning of Kindergarten, I use shared reading to teach print concepts. I have students come up and show me how to display the book, where the cover is, where the title is, how to turn the pages, how to read from left-to-right, etc. You can use a pointer stick as you teach these concepts. Shared reading can also be used to teach decoding strategies. Because students can see the large print, you can model how you use visual, syntax, and meaning clues to decode words. You can also get students actively involved in decoding! I like to use sticky notes to cover up part of a word, and then have students use the first letter and the picture to figure out what the word says. Fluency skills can also be easily taught during shared reading. You can point out punctuation marks and model how you pause or change your voice to match the punctuation mark. To get students actively involved in practicing fluent reading, you can have your kids chorally read part of the text that you’ve already read aloud. My Kindergarteners also think it’s funny when I model reading like a robot to teach them the importance of reading with expression. No matter what other strategies you are teaching, you should also always be teaching comprehension during shared reading. Talking about the meaning of the text should be part of every lesson, so that students understand that the primary purpose of reading is to comprehend the text. You can also include vocabulary instruction as part of your shared reading comprehension instruction. When I taught Kindergarten, I typically used only 1-2 texts throughout the week. On Mondays, we usually read a big book all the way through, focusing on comprehension and sometimes vocabulary. On Tuesdays, I chose a decoding teaching point. We usually wouldn’t get through the entire big book that day, because I was doing a bit more instruction. On Wednesdays and Thursdays, we read parts of the book again, but I chose different teaching points (i.e. fluency, vocabulary, a different decoding strategy, etc.). Sometimes on Fridays the class would act out the big book, or use puppets or props while we read the text together. This was a lot of rereading of the same text, so I made sure to explain each day why we were reading the text (i.e. “Today as we read, I want to show you how I make my voice match what is happening in the story.”) I also made sure to choose repetitive, engaging texts that the kids would enjoy reading with me. When I taught 1st/2nd, I tended to do more “chunking” of one text into smaller parts (although we definitely did reread texts at times). Sometimes I get hung up on the idea that I have to get through an entire text in one day, but that’s just not true! Since shared reading involves stopping and teaching skills, it’s just not realistic to expect that you will always get through an entire text in one sitting. Shared reading, as I’ve described above, involves quite a bit of pausing to teach or engage kids in practicing a skill. When I do a readaloud, I tend to go through the book a bit more quickly, stopping less frequently. The other most important difference between shared reading and a readaloud is that during shared reading, kids have their eyes on the print. During a readaloud, you may show the pictures to students, but they are not usually able to see the words clearly. Since students can see the text during shared reading, you are able to teach things like decoding more easily. How do you use shared reading in your classroom? Now it’s your turn! What does shared reading look like in your classroom? 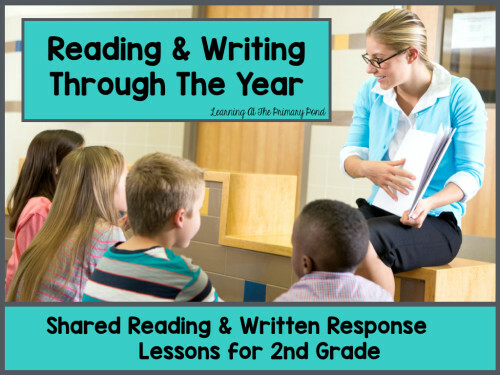 Do you use my shared reading lessons for 2nd grade? Thank you for sharing this information! It’s going to be very helpful. I am taking a course on guided reading and it delves into the different aspects of read including shared reading, but the description used was ambiguous……yours was right on target. Way to go girl!